South Santee Aquaculture, Inc./AlgaeControl.US subscribes to a philosophy we call the Water Trifecta©. It not only attacks the problem of algae, but more importantly it addresses the underlying problem for most ponds that is caused by the build up of nutrients and stagnated water beneath the thermocline. Beneath the thermocline there are oxygen levels that do not support aquatic life and where anaerobic bacteria thrive, especially in the warmer summer months. These bacteria consume bio-matter and release phosphates as part of their digestion process. The increased phosphate levels they generate in turn drive algae blooms. The combined work of the anaerobic bacteria and blue-green algae (cyanobacteria) produce organic chemicals such as Methyl Isoborneol (MIB), Geosmin, and Beta-Cyclocitral that result in taste and odor issues. In aquaculture facilities, these same chemicals causing the taste and odors can also cause off-flavor fish (an earthy, muddy taste). Many ponds arrive at this condition due to the overuse of copper algaecides, which have their place, but when overused cause bacterial death in the sediment. This causes the build up of nutrients to accelerate. Eventually, the bacterial population recovers and the release of the phosphates occurs as previously discussed. What results is the beginning of a perpetual cycle. There is merit to the saying that once you start to use copper to control algae; you will always have to use it. 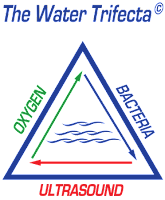 The Water Trifecta© works to reverse this by subscribing aeration, beneficial aerobic bacteria and ultrasound to prevent algae blooms from occurring.